Mechanic Job – Vermont Tire & Service Inc.
Vermont Tire’s Service department is growing. We are looking for a senior level mechanic. 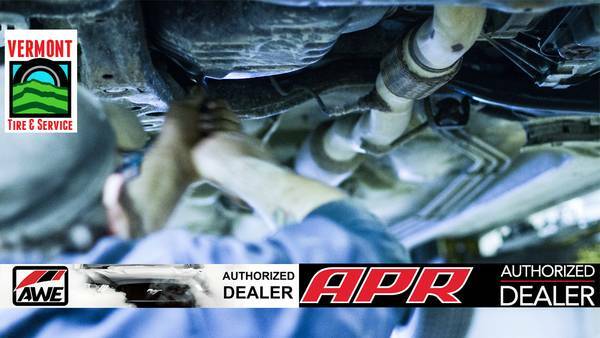 We work on everything but we are Vermont’s largest APR Performance dealer so Volkswagen and Audi Knowledge and certifications are a major plus as well as a love for auto performance. Salary is hourly with commission based on experience. a. Perform service operations that may include inspecting, diagnosing and completing repairs/replacements of automotive parts and accessories. These operations may include ignition systems, drivability issues, batteries, engine cooling systems, climate control, steering, suspension and alignment, exhaust, brakes and general preventative maintenance. b. Communicate clearly with customers regarding needed repairs ensuring they understand service recommendations and are at ease with services to be performed. d. Properly document customer service record with updated information on work performed and/or recommended. f. Understand and follow federal, state and local regulations, such as those governing the disposal of hazardous wastes. • Ability to communicate effectively with all levels of customers, management and staff.